The hotel is on beach and have beautiful view from the room. They change our room (because we booked on park side so they change on beach side). The rooms were rented to my client who was very happy with the stay, service and additional amenities. The food was good, the personnel OK, the water of the pool was cold and the beach needs some work. The rooms were excellent, and also the entire resort. Nice park with trees, lake view breathtaking. All in all good place. bardzo dobra kuchnia, smaczne posiłki, może trochę za mało urozmaicone. 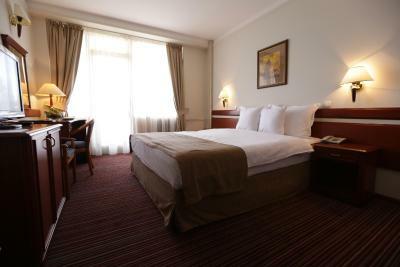 Hotel czysty. W pokojach było wszystko co potrzebne, do tego czysto i schludnie. Ładna plaża, fajny basen. Luogo fantastico. Sole, Acqua, Aria , Verde rilassante che ti circonda. Se si ha bisogno di riposo questo e' il posto giusto. Personale gentile e discreto. Просторный номер и большая территория. Наличие балкона и вид на озеро. 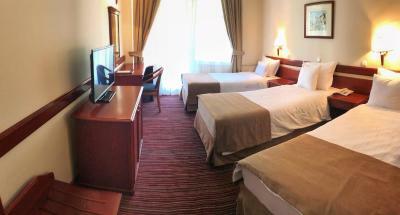 Otel ohrid şehir merkezinin biraz dışında, konum olarak çok güzel bir yerde. Kendine ait uzun bir plajı var. Şehir merkezinde konaklamak zaten anlamsız. Araç kiraladığım için hiç sorun yaşamadan şehir olanaklarını yaşayıp otele döndüm. Hotel na dobroj lokaciji,blizu centra Ohrida,hotel sa dobrom uslugom,odlicnim doruckom i vecerom.Usluga na nivou,taman onako kako treba,ne nametljiva,a osoblje spremno da pomogne u svakom trenutku.Parking,setaliste oko hotela,plaza,bar sve ok.
Hotel Metropol – Metropol Lake Resort This rating is a reflection of how the property compares to the industry standard when it comes to price, facilities and services available. It's based on a self-evaluation by the property. Use this rating to help choose your stay! 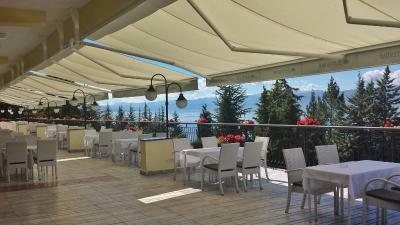 Hotel Metropol – Metropol Lake Resort is located between the shore of Lake Ohrid and the green forests of the Galicica National park, boasting amazing views of the lake and the mountains. 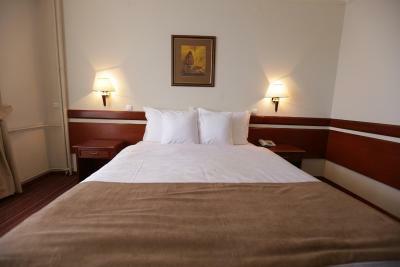 All rooms are stylishly decorated; they have air conditioning and all necessary amenities. A sauna and massages are available as well. Savor authentic regional cuisine as well as international dishes accompanied by the sound of traditional music while enjoying an amazing lake view. 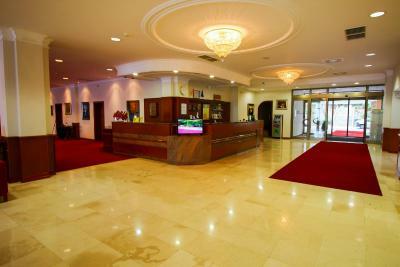 Benefit from the banquet hall as well as the conference hall. 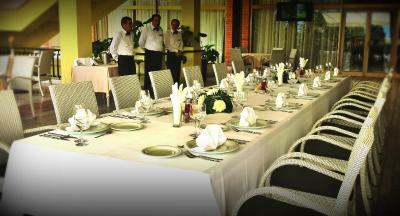 Informal conferences as well as large meetings can be organized at the Metropol. If you prefer to spend your holiday actively, there are volleyball and basketball playgrounds, table tennis, and a dancing bar for your entertainment. 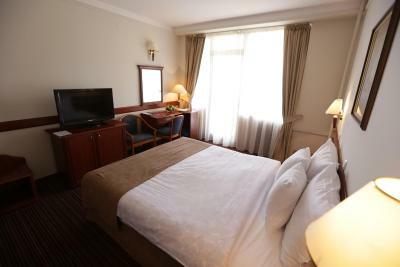 The hotel is part of a resort including the Hotel Metropol – Metropol Lake Resort, the Bellevue and the Tourist hotel and you can use the facilities of all of them. 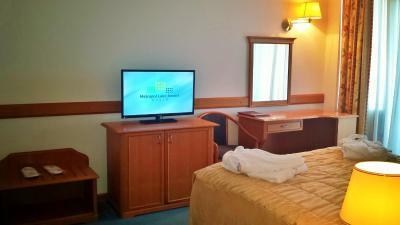 When would you like to stay at Hotel Metropol – Metropol Lake Resort? This air-conditioned room features a balcony and cable TV. 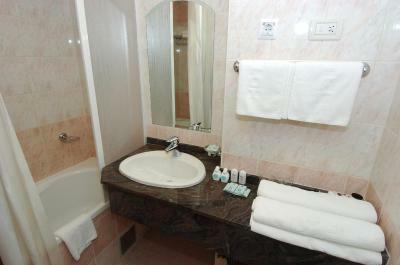 This air-conditioned room features a balcony, cable TV, mini-bar and a bathroom with hairdryer. Hotel Metropol is located on the shore of Lake Ohrid, with a private 500 meter long beach from one side and National park Galicica from the other side. It's surrounded by pure nature with fresh air and breathtaking views. 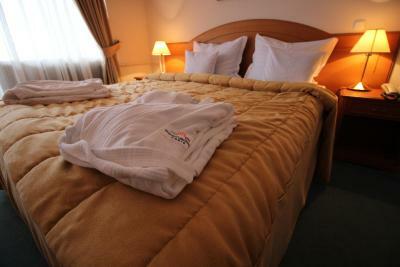 House Rules Hotel Metropol – Metropol Lake Resort takes special requests – add in the next step! Hotel Metropol – Metropol Lake Resort accepts these cards and reserves the right to temporarily hold an amount prior to arrival. The water of the pool was cold. I understand that hotel has swiming pool but you are actually can use pool from the hotel next to. 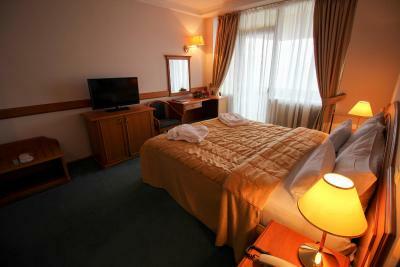 The looby look very nice and new but rooms need renovation. The cleaning staff could do a better job with the rooms. Otherwise the rest of the staff was extra friendly and obliging which is not always the norm in Macedonia. I stayed there for 4 days with my partner in August. We really liked the hotel grounds. There are a lot of trees which was very important for us since we don't really like laying in the hot sun. The lake water is nice and clean in that part of the shoreline. The architecture of the hotel is typical of the socialist era which is a matter of taste but we personally loved it since it gave the whole place a nostalgic Yugoslav feel to it. The breakfast was quite varied and satisfying, including yummy local fresh fruits. The coffee was probably the only thing we didn't like. :) The a la carte menu was really tasty yet very reasonably priced! Much better than any of the overpriced restaurants downtown. Parking is very convenient, and whoever has traveled to Ohrid by car in peak season knows what a nightmare that can be. The views, especially the sunsets are magnificent if you get a room facing the lake. Our regards to the front desk staff who were very kind and professional! 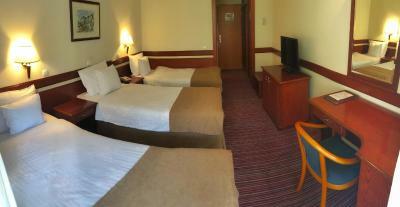 Despite the cleanliness of the room not being in tip-top shape we'd definitely stay there again. We booked 2 rooms, one room for 2 adults and one room for 3 adults. When we got there at check in even though we had a confirmed early checkin through booking they told us no, when I showed us the email they told us to wait for 30 minutes and they would "try to do something" they finally gave us a 1 room and said we had to wait for the other one. we said ok, no problem. We went to the room for 3 people, it was a room with 2 beds and then 2 sofa cushions on the floor. Not to mention that the room was hot. When I went down to reception and told them that we paid for 3 beds they said "yea this happens a lot" its for a child. We do not have enough 3 bed rooms. OK.. so in the mean time my mother and father go to their room. The AC dose not work at all. and it is 40 degrees out. that is over 100F. So after talking to 3 people and having them be very rude, they tell us that they have a room with 3 beds. So we move all of our stuff there and after moving everything we realise that the A/C dosen't work in this room either. So I go back down and tell them. they send a repair man and he tells us "yea its broken, and there is nothing that I can do, its very hot out" it was like being in the twilight zone. I go back down to the front desk and they say "we will see what we can do tomorrow" I just said, move us back to the room we were in before with the bed on the floor, at least it had some "a little A/C" so that 1 person would be uncomfortable, not everyone. This same thing continued the entire time we were there. They were rude, their hotel rooms were terrible, there was NO WIFI anywhere except the lobby and there is was so slow you could not use it. The hotel SAYS IT HAS A POOL, BUT IT DOES NOT. it uses the pool of another hotel. there were NO POOL TOWLES even though they say that they have them. We spoke to other guests and they also had a lot of issues.